Wooden furniture will expand if it’s exposed to moisture and freezing conditions. You can find treatments for your wooden furniture at a local DIY store. It will protect it from moisture and in turn prevent it from warping. 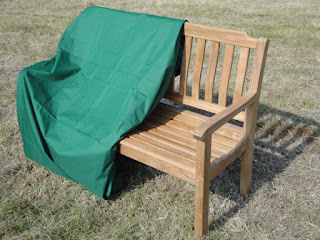 Purchase some waterproof furniture covers. They will stop water from getting to your furniture and also add a layer to stop the cold getting to them. Try and raise your furniture from the floor. If you place each table leg on a brick for example, you will avoid the legs sitting in water. If you have space in a shed, try and bring the furniture inside. This is the easiest way to avoid water and temperature damage. 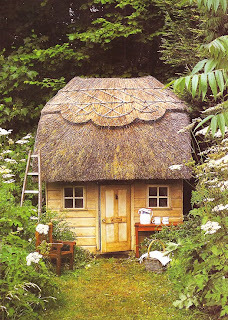 Answer...a garden shed! When we moved house four years ago I needed one to store my tools and do a bit of potting while I transformed the wilderness that accompanied our new home. I built the shed equivalent of Dale Winton. Why do all commercially bought sheds look as if they’ve been ‘tangoed’? 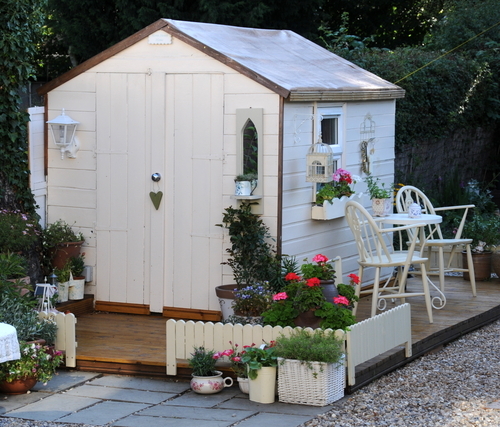 My previous shed had been tucked away under a huge lilac tree. Fragrant roses and honeysuckle scrambled over it and mature shrubs almost hid it from view. 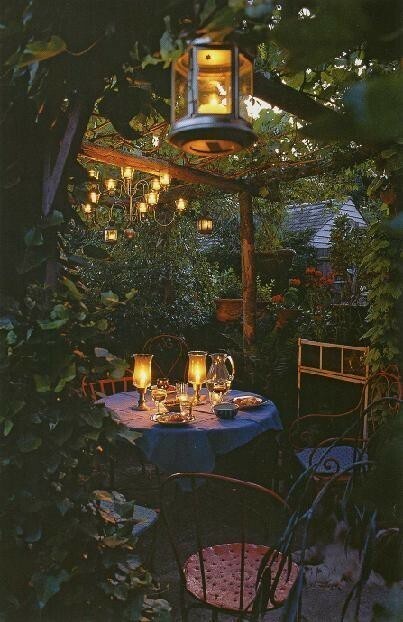 It was my little sanctuary, a den to which I could flee and where, while transplanting seedlings and potting up bulbs, I could forget the stresses of the day. My new shed was the only vertical feature on an otherwise bleak landscape of stony soil. I couldn’t live with it but how could I disguise it? 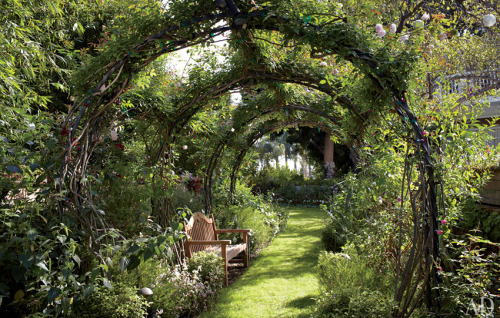 Shrubs would take a few years to establish, as would climbing roses. In the meantime it leered ‘orangely’ at me and looked...hideous. I applied logic and a large gin and tonic to the problem. If I had already had mature shrubs I could simply have painted it black or very dark green so it would have blended with the shadows. No such luck. There was nothing for it, I’d have to make a feature of it. I hit the garden centre to check out colours. I was amazed. Timber preservative manufacturers now produce a vast range of beautiful tints. I could have painted my shed almost any shade I chose. I toyed with a jolly red and white striped beach hut idea for a while, then spotted a jaunty yellow which I thought might be a laugh. There was also a gorgeous blue. For every colour I could imagine choosing plants to complement or contrast. In the end I settled on a soft sage green, to complement the silver leaved plants which I knew would do well in our dry, stony soil. I also indulged myself by painting the inside a light cream, which is so much brighter on overcast days. Four years on, the heavily scented, pale pink rose New Dawn scrambles up the trellis attached to the side. The shrubs I planted to the front are beginning to provide cover and the nearby Eucalyptus provides a bit of height. My mother was inspired to paint her shed after seeing mine. Her garden is so tiny that disguise wasn’t an option. She went for vivid blue with a stained glass window! It looks stunning surrounded by vibrant pots and hanging baskets. Why not get creative this month? Say no to orange and yes to red, blue, yellow, grey and lilac!